For the past few years, Connecticut has been experiencing a heroin overdose outbreak wrapped in a pharmaceutical opioid epidemic. The heroin problem has been expanding despite efforts by government officials to bring it under control. 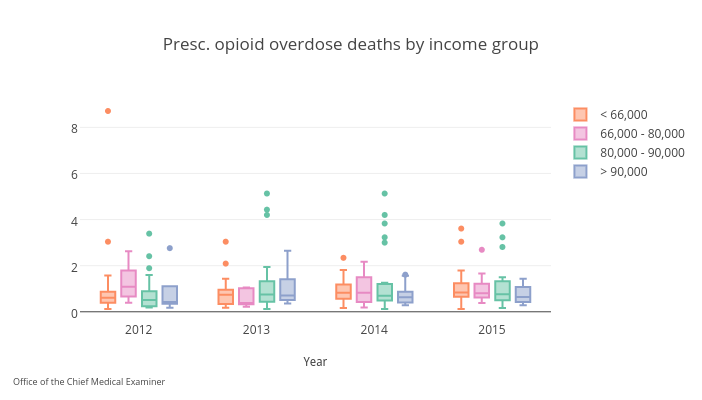 Earlier this week, Trend CT looked at who in Connecticut has died or been affected by the rise in opioid abuse, as well as where and why. Today, we look at which type of drugs have been devastating communities the most, what lawmakers have attempted to do to contain the crisis, and what more can still be done. Recently, there have been increased findings of fentanyl in toxicology reports for drug overdose deaths. In fact, the number of heroin overdose deaths increased by 36 percent between 2014 and 2015, while deaths from fentanyl jumped by 165 percent. The fentanyl causing these fatalities is not the fentanyl typically found in hospitals, officials said. Rather, it is a less-pure version laced into heroin to increase its potency. This also increases the user’s risk of death. As controls on pharmaceutical opioids have tightened, over time it has become easier for people abusing pills to switch to heroin because it is cheaper, far more plentiful, and less difficult to get. 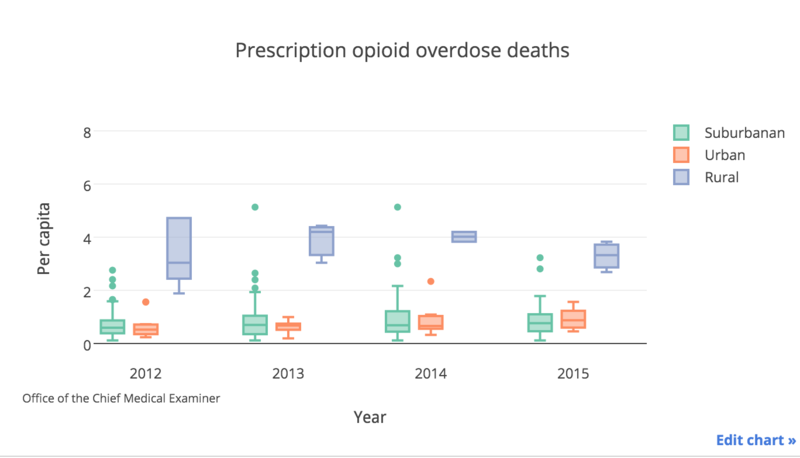 The raw data for all of 2015 was not yet available from the Chief Medical Examiner so calculations regarding the number of deaths caused by prescription opioid pills could not be made. 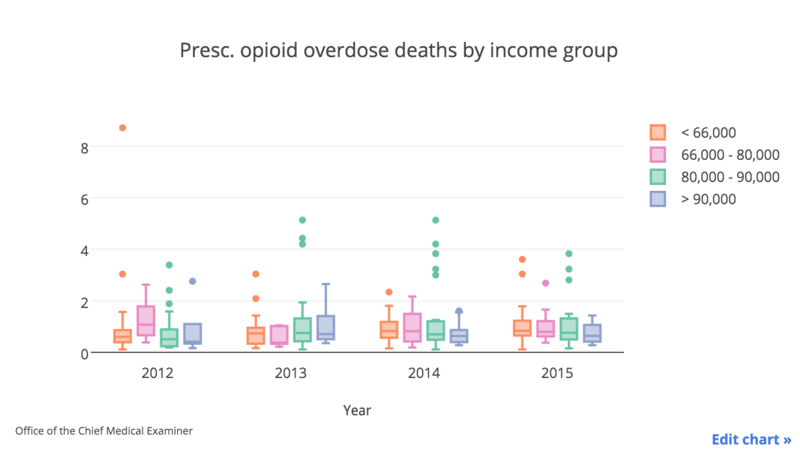 The rate of death from prescription opioid overdoses appears steady. A community’s median income does not appear to be a differentiating factor. 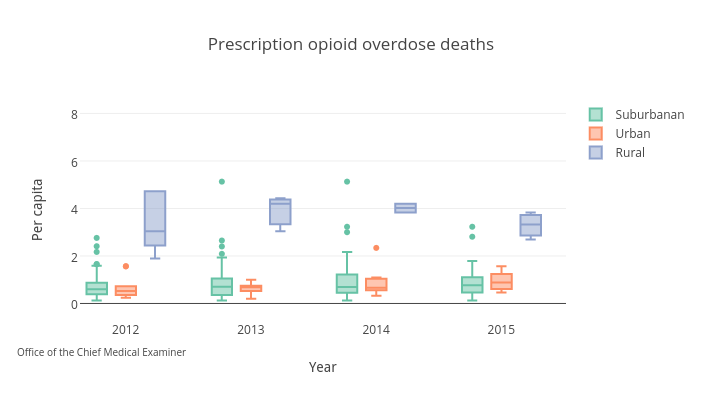 Though the median death rate for prescription opioid overdoses increased in urban and suburban towns between 2014 and 2015, there has been a slight decrease in rural areas since 2013. 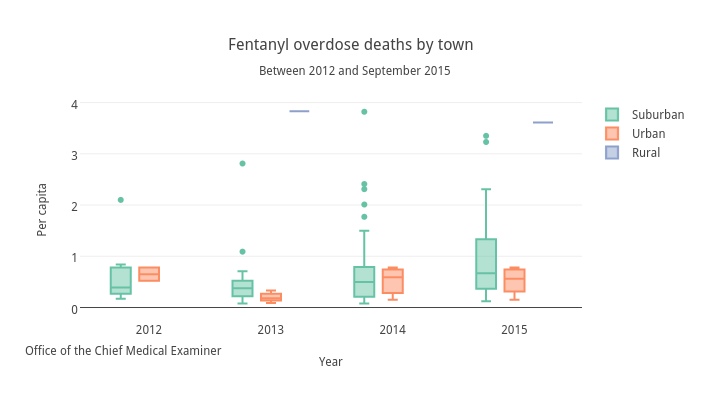 Fentanyl initially appeared as an urban overdose problem. 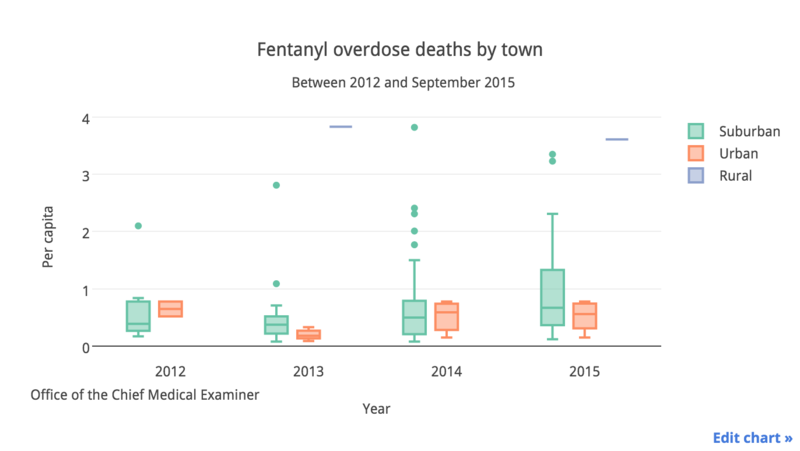 But year by year the data shows fentanyl is affecting the suburbs with increasing lethality. 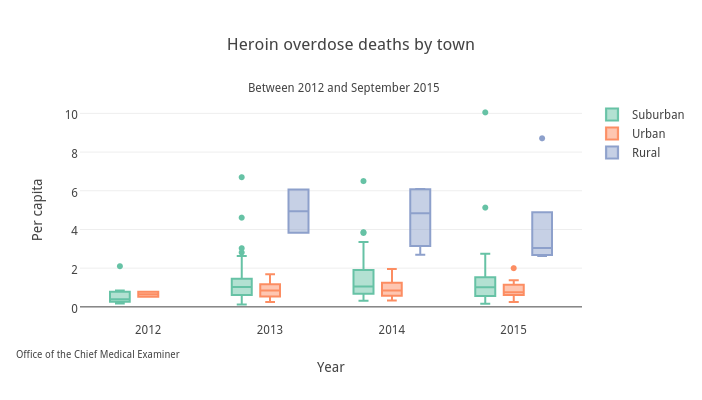 As the number of fentanyl overdose deaths increase, so does overdose deaths from heroin. 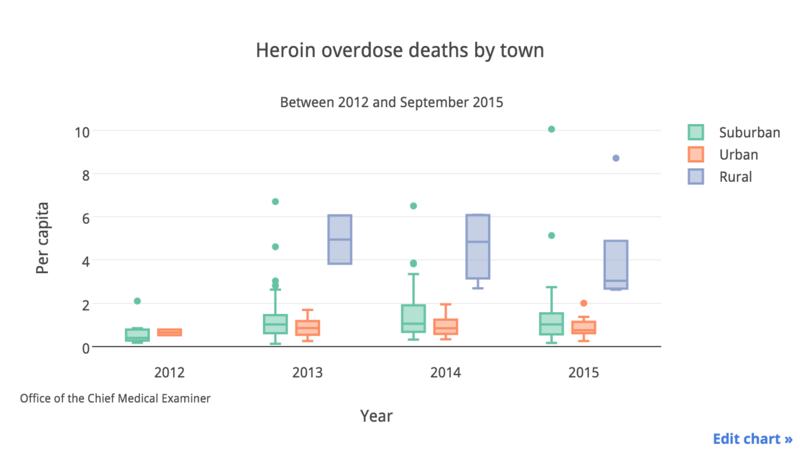 The death rates from heroin overdoses in suburbs and rural areas is higher than those in urban areas in Connecticut. It just shows the importance of having clinics and other points of treatment for the areas way out there in rural parts of the state. In 2008, Connecticut's Department of Consumer Protection established the Prescription Monitoring Program to track patients' controlled substance use from doctor to doctor. It was meant to close "pill mills"— medical practitioners who overprescribe— and prevent "drug diversion," which is a method of transferring a prescription to another person. In 2012, legislators changed state law to allow health care providers to prescribe the overdose reversing drug naloxone to people who might be able to prevent an overdose, not just drug users themselves. But even today not all emergency officials in all towns have access to the drug through a bill recently passed requires all towns to update their medical emergency service plans to include it. Two years ago, the state also approved a "Good Samaritan" law protecting people from prosecution for minor drug crimes if they're seeking medical attention for someone else who is overdosing. Most recently, the White House has requested $1.1 billion from Congress to fund state grants for opioid treatment and prevention. Current proposals for legislation center on ways to compel doctors to screen all patients when prescribing opioids, have conversations about the addictive qualities of the drugs, and to make the number of pills prescribed proportionate to the medical situation. Focusing on the opioid prescription supply is wise, but it's just one piece of the puzzle, said Dr. Traci Green, who researched opioid-related drug abuse in Connecticut and recently helped draft drug treatment legislation in Rhode Island. The prescription pill involvement hasn't gone completely away but it has been supplanted by the heroin problem and fentanyl deaths today, she said. "It is indeed squeezing one end of the balloon, but now we're dealing with a whole set of other balloons and there are more of them and there are razors on the outside and when they explode they hurt everybody," said Green. While the scope and scale of the opioid and heroin overdose problem seems to be expanding, some government resources are being squeezed. The Department of Mental Health and Addiction Services, which offers various services that act as a safety net to addicts and those in recovery, said they anticipate reducing the number of treatment beds available in order to cut $34 million from their budget. Some needle-exchange organizations said they quickly run out of supplies of naloxone and need more though they don't have the funds to buy more. Department of Public Health Commissioner Dr. Raul Pino said it was a priority to get free naloxone to those who need it, even though his department faces budget cuts, as well. "DPH is paying for it. If I have to beg for more, I will," said Pino. Some states are paying for naloxone by taking 10 percent of the money from drug-related civil forfeitures, said Green. In California, legislators are considering taxing pharmaceutical companies to pay for a state supply. Naloxone might save lives, but it doesn't cure. For every death, there are countless more overdose injuries, said Green. "We really have to rethink how we address and contain the problem and how we prevent in a humane way these deaths from occurring," she said. Especially in the rural and suburban areas where data shows victims are being affected most. Rhode Island is considering a new bill that proposes strategies to deal with the drug overdose epidemic by targeting prevention, rescue and treatment, as well as recovery. The process for a pharmacist to be certified to prescribe naloxone in Connecticut is much more complicated than it is in Rhode Island, said Green. Also, there is no central database collecting a list of pharmacies or police or fire departments that have access to Naloxone. "We have nowhere to point family members to who are looking for a detox or treatment center with a naloxone component or a doctor who prescribes Suboxone," said Shawn Lang, the Deputy Director of AIDS CT.
Three years ago, legislation in Connecticut made it easier for family members of addicts to be prescribed naloxone but Lang said she found most people did not want to ask for those prescriptions because of the stigma attached to them or to avoid its showing up on insurance. Lang has trained about 500 people on harm reduction, addiction, overdose and administering naloxone. She said she looks forward to new legislation allowing all certified pharmacists to prescribe the anti-overdose drug as well as requiring all police and fire departments to carry it. "There's no point blaming anybody on this, we all have a role to play," said Rep. Elizabeth Esty at the New Britain forum on Monday. She spoke of upcoming bills in Congress that would address some of the concerns and worsening crisis. "There's no place that's safe, and we're trying to help, to transform what we're experiencing in Connecticut." Monday: How we put together the analysis.